A public group comprises of many sets of users namely (1) general set of users; or (2) set of users within a territory; or (3) set of users within a specific role; or (4) subordinate users within a role hierarchy; or, (5) other groups. 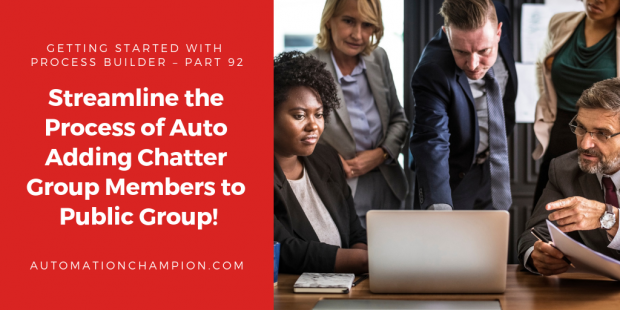 Whereas Public Groups can be used for multiple purposes, Chatter Group is primarily geared towards boosting collaboration among users within an organization. Similar to a public group, a Chatter group comprises of a set of users too. Indeed, one can add unlimited users to a Chatter Group. It is a daily job of a Salesforce Administrator to add users to public groups or chatter groups. In many organizations, it is a System Administrator’s responsibility to keep these groups in sync. Let’s take a business use case to understand how a System Administrator can use automation to fulfill his/her aforementioned responsibility. If a user is added to the Sales – EMEA chatter group. Then, the user must be added to Sales – EMEA public group. Amy mentions to Donna that achieving the above entails tons of manual work as UC has many Chatter and Public Groups and the same business process must be followed in all cases. Donna assures Amy that she can automate the process going forward! Ah! What a relief! Amy thanks Donna and learns from her how to automate the process. Come along, join Donna and Amy on the journey! There are a few possible solutions for the above business scenariobut, we’ll use Flow and Process Builder to solve the above business requirement. Before trying to understand the technical aspect of the solution, let us spend some time to understand the general flow at a high level. Please spend a few minutes to go through the following flow diagram and understand it. 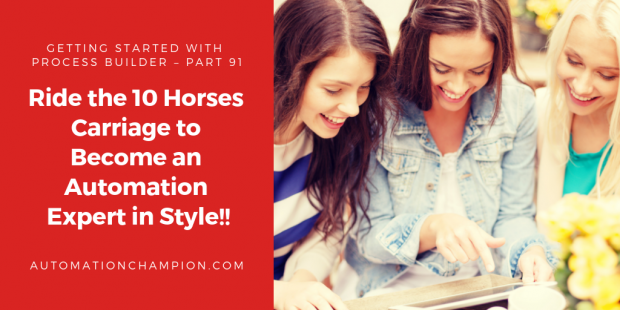 Read the rest of this entry!